Save 50% Off Sprint Plans | A Savings WOW! When you’re looking at ways to save on your monthly budget, one easy way is with your phone. With how quickly new technology and new phones are introduced, you can easily spend a fortune by continuing to upgrade your phone to the newest one. Sprint has come up with a plan to help you keep up without draining your bank account. With Sprint’s Galaxy Forever program, you can upgrade to the latest Galaxy smartphone any time after making 12 payments on a Sprint Lease. Right now, the latest generation of the Samsung Galaxy series are the Samsung Galaxy S7 or Samsung Galaxy S7 Edge. • Lease the latest generation of the Samsung Galaxy series at any Sprint store, sprint.com or 1-800-SPRINT1 and confirm that you wish to participate in Galaxy Forever. • Make 12 payments on your Galaxy Forever Sprint Lease. • Upgrade to the next Samsung Galaxy flagship device with a quick and easy return of the used device in exchange for the latest and greatest smartphone. In addition, you can also save big on rate plans by switching to Sprint and taking advantage of the biggest wireless offer in U.S. history. 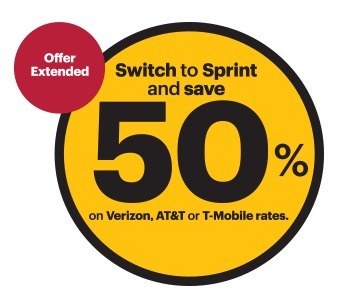 You can switch to Sprint and get 50 percent off most AT&T, T-Mobile and Verizon rate plans. In addition, Sprint will pay switching fees up to $650 per line. • When you bring a number to Sprint, they will pay your switching fees up to $650 per line via an American Express® Reward Card after online registration and phone turn-in. • Visit your local Sprint store, Sprint Store at RadioShack, www.sprint.com, or call 1-800-Sprint1 to switch. • Get your new device with Sprint Lease, Galaxy Forever, iPhone Forever, Sprint Easy Pay installment billing or pay full retail price for the device. Or bring your own compatible device. • Customers must port one line, and can add up to nine additional lines on the account. • Customers must choose from the 50 percent off rate plans available from their current carrier. • Cricket and MetroPCS customers also can switch and save 50 percent off their parent company’s postpaid rates. • For customers who act on this exciting offer, their 50 percent off savings will be good until Jan. 8, 2018. We’ve been using the new Samsung Galaxy S7 from Sprint in the Chicago-area for about a month now. We have been very pleased with the service. We’ve found that coverage has been pretty solid whether we’re in our home, in another indoor location, outdoors or while on the road. Since we are starting to have more cell phone users in our household, we are definitely looking for ways in which to maximize our cell phone budget. With Sprint’s plans, it may be our best solution! Disclosure: We received the Samsung Galaxy S7 with Sprint service for review. All opinions are our own, honest opinions.